MANILA – This time around, Fray Dionisio Selma, OAR, as the Prior Provincial, took to a higher level his role as “the principal driving force for renewal of the province” as set down in the Constitutions. Father Selma who is also the Chairman of the Board of Trustees (BOT) of the San Sebastian Basilica Conservation and Development Foundation, Inc. (SSBCDFI, or better known as Bastecon) called for an urgent assembly of those he believed would be the key players for the Foundation to take the challenge of revitalization and restructuring. More concretely, the assembly was aimed for assessment and planning vis-à-vis the raison d’être of Bastecon, the life and mission project of the Recoletos friars within the quadrennium 2018-2022, and its evangelizing impact to civil society as a whole. For the first time since its establishment in 2010, Bastecon saw the unprecedented assembly of some of the important figures in the Province of St. Ezekiel Moreno at the San Sebastian Parish Hall on August 15, 2018. Among those present were the Provincial Councilors, Chairmen of the Commission on History, Culture, and Heritage-Recoletos (CoHCH-R) and the Commission on Communications and Publications-Recoletos, (CCP-R), the former and current local priors of Recoletos de Manila Community, President of San Sebastian College-Recoletos Manila, the former and current rectors/parish priests of the San Sebastian Basilica Parish, and the members of the BOT. The archivist of the Provincial Archive in Bulwagang Recoletos, two representatives from the Congregation of the Augustinian Recollect Sisters and some lay collaborators were also among the close to twenty-five in attendance. Dr. Gabby Lopez, an urban planner and educator by profession, adeptly facilitated the whole-day activity that involved everybody’s participation especially during small group workshops and plenary discussions. His being an ex-seminarian and devotee of the Our Lady of Mt. Carmel smoothed the way to understanding the vocabulary of religious life which was technically crucial in resolving certain issues where the language of the Church “interacts” with that of the corporate world, or vice versa. The first part of the morning sessions which was opened with a prayer led by Fray Emilio Edgardo Quilatan, OAR set the “friendly” mood and tone for the gathering and provided a useful overview as to the state of the Bastecon. Fray Amado Emmanuel Bolilia, OAR, the Executive Director, in his welcome address, first acknowledged those present and invited everyone to generate the atmosphere of dialogue and listening. Fray Bolilia also stood as the emcee of the program that opened at 8:30 in the morning. In his opening remarks, the Prior Provincial sketched the reasons of the assembly and pointed out some areas to work on in view of the Recoletos’ continuing program of evangelization through the basilica which is home to the 400-year old image of Our Lady of Mt. Carmel de San Sebastian. Fray Selma, a two-termer “father” of the OAR religious working in ten countries (i.e., Philippines, Taiwan, Sierra Leone, CNMI, USA, Italy, Spain, Panama, Cuba, and Colombia) also expressed his gratitude to all volunteers, collaborators, and the Recollect religious for their time, talent, and treasure. “We are simply (God’s) instruments,” he concluded. Fray Lauro Larlar, OAR, a BOT member, situated the pressing concern of the apostolate of “conservation and development” of the basilica within the Life and Mission Project (LAMP) of the Province for 2018-2022. With his call replete with verbs such as “renew,” “re-integrate,” “restructure,” “restore,” including “return [the apostolate] to CoHCH-R”, Fray Larlar stressed the interrelationship among Bastecon’s tripodic function, namely, as tool for evangelization, habitat of Christian formation, and platform for social services. To give a hawk’s eyeview of the evolution of the Vision-Mission Statements and Strategies of the Foundation as well as the timeline of the Bastecon, Fray René Paglinawan, OAR, the current BOT secretary, noted that the Foundation was registered with the Securities and Exchange Commission (SEC) in August 2010. Then, the Foundation with its acronym SSBCDFI was born, continuing to address several areas: research and study, stabilization and restoration, conservation and development. As the first Chairman of the CoHCH-R after the said commission was created by the Fourth Provincial Chapter held in February 2009, Fray Paglinawan presented to the assembly the 2012 and 2016 versions of the Vision, Mission, and Strategies of Bastecon. He also mentioned that the basilica was included in the World Monuments’ Fund Watchlist 2010. In 2011, the US Ambassadors’ Fund for Cultural Preservation gave a considerable amount to fund the first phase, the Diagnostic Phase. 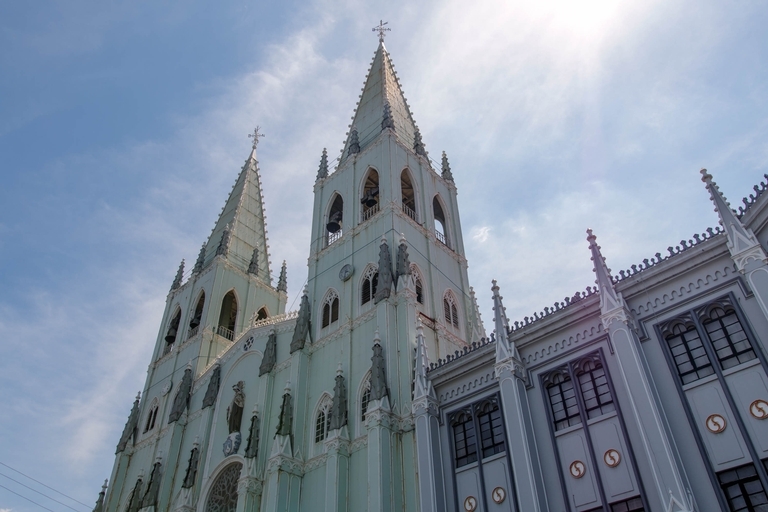 Such aid was granted at a time when, in 2011, the basilica was declared a National Cultural Treasure by the National Historical Institute (NHI). Thirty-eight years earlier, in 1973, it was listed among the National Historical Landmarks of the Philippines. Triennium 2015-18 saw a follow-up to the ongoing project. The Diagnostic Phase was officially closed in February 2015, and the second phase (the Design Phase) which is the current one, still mainly under the financial support of USAFCP, set in. “Under Fr. Manny Bolilia, incumbent executive director, representing Fr. Provincial Fr. Dionisio Selma since 2015, the Foundation went through several training seminars on leadership and organization, which resulted in the creation of several offices: administration, technical, communication, fundraising (or philanthropic office), and community development,” he acknowledged. In 2017, a well-designed physical office was built by way of renovating the space adjacent to the laundry area and guest rooms at the second floor of the San Sebastian convent. On the technical side, Ms. Tina Paterno, a cultural heritage expert and also a BOT member, presented a summary of work accomplished so far since 2010. The work was labelled “Sustainable Restoration Project” which was initially spread within a ten-year span, characterized by long-term solutions, and in accord with international standards. In three phases, the said restoration project consisted of: 1) Documentation, Diagnosis and Testing; 2) Design of repairs: structural, architectural, painting, electrical, sanitary, lighting, and passive cooling; and 3) Construction. According to Ms. Paterno, the synergy of the different departments such as marketing, PR, fundraising, special events, tours, and merchandise sales was constant through all phases. Like gold tested in fire, Bastecon was and is never insulated from some forms of “trials and tribulations” both internal and external to the system. Finally, Ms. Paterno went on to give an update on the accomplishment level of the second phase: lighting, 70%; electricals, 10%; architectural, 70%; structural, 50%; sanitary, 0%, although preliminary survey has already been done; cathodic protection, 10%; passive cooling, 55%; acoustic design, 0%; site planning, 10%; paint analysis, 70%; surveys and assessments and correction of past repairs, 70%; and sustainability (of merchandise, tours, events, community development, PR), 90%. Fray Bolilia, incumbent Executive Director, spoke about the administrative aspect of the Foundation. His updates revolved around the areas of Human Resource, Community Development, and Fundraising. Several points in these areas were practically supplied and elucidated by earlier reports. Having divided the participants into three groups and put the pieces of the inputs and feedbacks together, Dr. Lopez steered the workshop-like sessions into engaging discussions and exchange of ideas that, in the end, harvested notable insights, realizations, proposals, and action plans. The expression “in solidum,” which is literally translated as “for the whole,” has been applied to mean that certain projects or tasks entrusted to, say, a certain religious community ought to be accomplished by the members of that community and/or to be done in the name of the community. One of the groups referred to that as the “tatak Rekoleto” or Recollect brand—or at least, an attribute of that brand—of doing an apostolate. Furthermore, based on their outputs, the groups were in agreement on the three items that need urgent action: organization, immediate repairs, and strategic communication. Different models for the re-organization of the BOT were suggested. And while the number remained to be nine, the composition was reconfigured, with the inclusion of the Chairman of the Commission on History, Culture, and Heritage-Recoletos. Fray Henry Santiago’s talk about his observations on the By-laws and Articles of Incorporation was greatly helpful in the restructuring of the BOT and in view of the impending revision of the said documents. Towards the end of the meeting, two things were proposed: One, that the Provincial Council study and review the organizational structure of the Foundation which is composed of the BOT, Executive Committee (Execom), and Operational Management Committee (OMCom) under which the following standing committees fall: Technical, Strategic Communication and Fundraising, Community Development, and Administrative. Two, that the Vision and Mission Statements of Bastecon be reviewed and reformulated. To accomplish this task, the assembly appointed Fray Leander Barrot, Fray Jose Ernil Almayo, and Mr. Augusto “Bing” Kimpo. 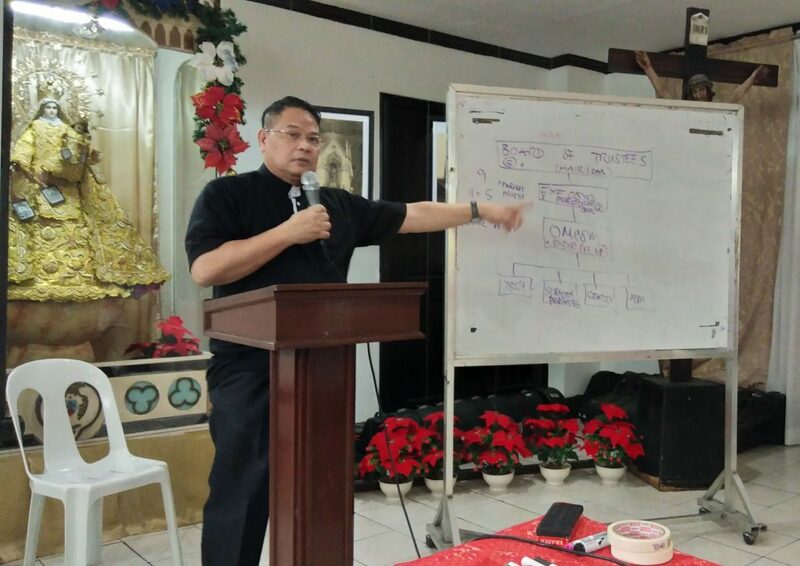 Shortly after the assembly, the incumbent members of the BOT stayed put for some important concerns, part of the goal-setting to ensure that this herculean cultural heritage apostolate, while still under construction, is on the right track for more collaborations and breakthroughs in the service of evangelization.